I have become kind of a Christmas person this year. 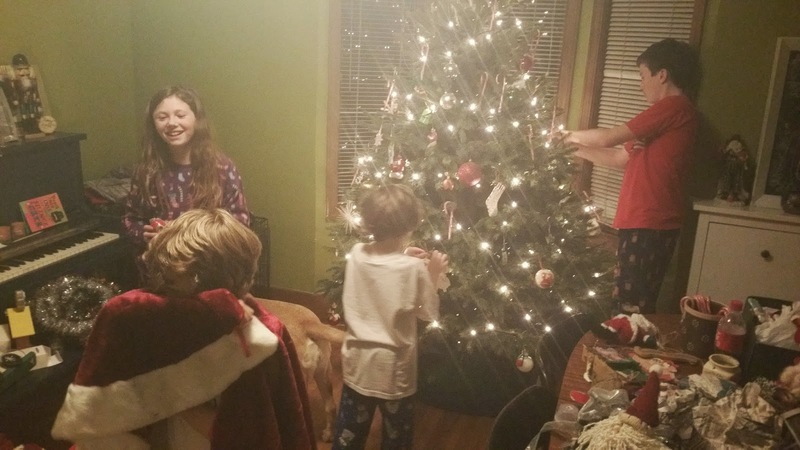 For a long time, the holidays stressed me out and made me relive painful memories from Christmas past. But it's changing. I'm older, maybe a little wiser, I have an amazing family and so much to be grateful for, I just feel more mushy and happy over sad and depressed. I mean there are moments where I get lost in a bad memory or I feel overwhelmed by the insanity of all the busyness and you better buy everybody you know a gift of it all. But I don't get stuck there like I have before. Usually every Christmas season I bemoan the holidays and the hoopla even though I do enjoy a few parts of it. Mostly I usually feel itchy and unhappy until a few days before Christmas when I have a Scrooge or Grinch moment and the joy of it all washes over me and I want to throw open the shutters and sing with the Who's of Whoville. This year is different. I feel more present. My kids are older and I just feel the sense of "this isn't going to last forever" not so much hanging over me, more like time whispering to me, reminding me to soak it up and let it fill me up with love and goodness. Peyton went to a sleepover on Friday night and I asked him if he wanted to go to Breakfast With Santa on Saturday morning or skip it. "What? Of course I'm going, it's Grandma and Bubba's thing, right?," he asked. "I'm going." "Well, of course," I said smiling. 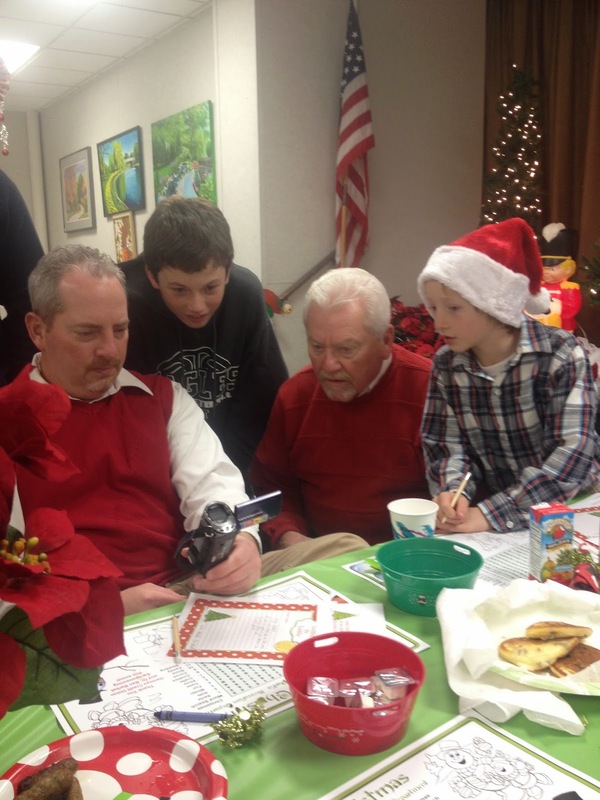 Peyton, JT, Tim and Tim's dad (Bubba) at Breakfast with Santa checking out video of another cousin's sporting event. It's a Christmas miracle! We are all looking at the camera! Merry Christmas, Happy New Year, God Bless Us Everyone! and how the two little kids are all snuggled up with Santa. We are all showing up this year and soaking it up and letting the season fill us up with joy and love. We are making the hot cocoa, watching the Christmas movies, going to the hometown parade, counting down with the Advent calendars and playing the Christmas music. 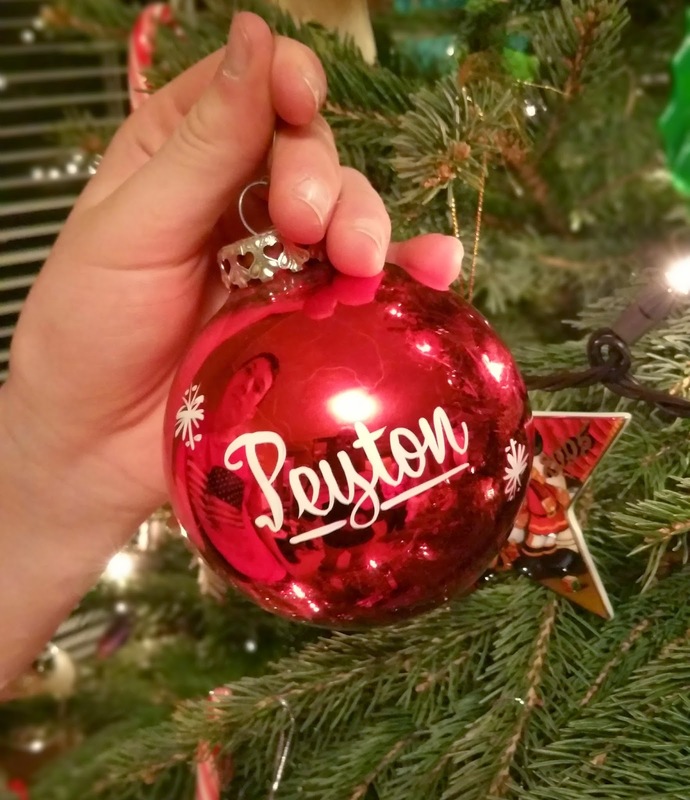 My in-laws started this tradition of buying the kids a name ornament on their first Christmas. I love it so much. It's just like the Brady family on Days of our Lives....remember that? I always thought it was so cool and now it's my family. Joy! I treasure these hand-written Christmas wish lists to Santa. JT wants "gluten free marshmallows." I mean it just bursts my heart open with love when I see this stuff. 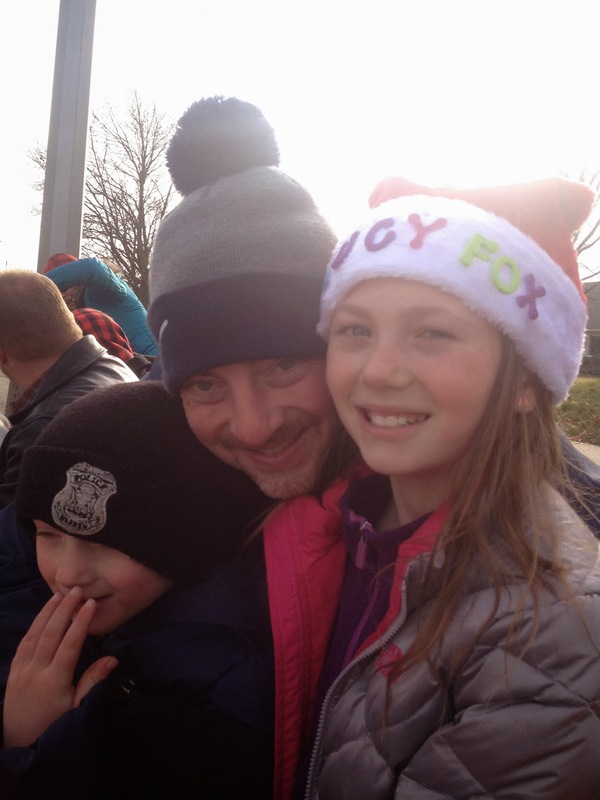 Hometown holiday parade! Lucy wishes her last name was Fox. I don't think she understands yet how cool the last name Youngblood really is. This coming from a girl whose last name used to be Smith. Our favorite background music for our holiday lovefest this year is Idina Menzel's new album Holiday Wishes. It's beautiful and soulful and sad and joyful and everything you want in a Christmas album. I mean when I heard her sing in Frozen (she was the voice of Elsa) last year I was hoping she would sing something for Christmas. I mean right? Her booming voice is perfect for it. When she sings "Silent Night" I want to spin around with my arms open like Elsa. It's simply amazing. Holiday Wishes is out now on Warner Bros. Records. The album was produced by Grammy Award-winner Walter Afanasieff and features favorites such as "Have Yourself A Merry Little Christmas" and "Do You Hear What I Hear." She also does a duet with Michael Buble, they sing "Baby It's Cold Outside." The album is a mix of upbeat and slower songs. There's even a song for when I'm feeling a little reflective and somber, it's a beautiful version of Joni Mitchell's Christmas-themed "River." I could listen to her sing this over and over, and well, I have already. My favorite song she sings on this album is "December Prayer." It is my theme song this season. 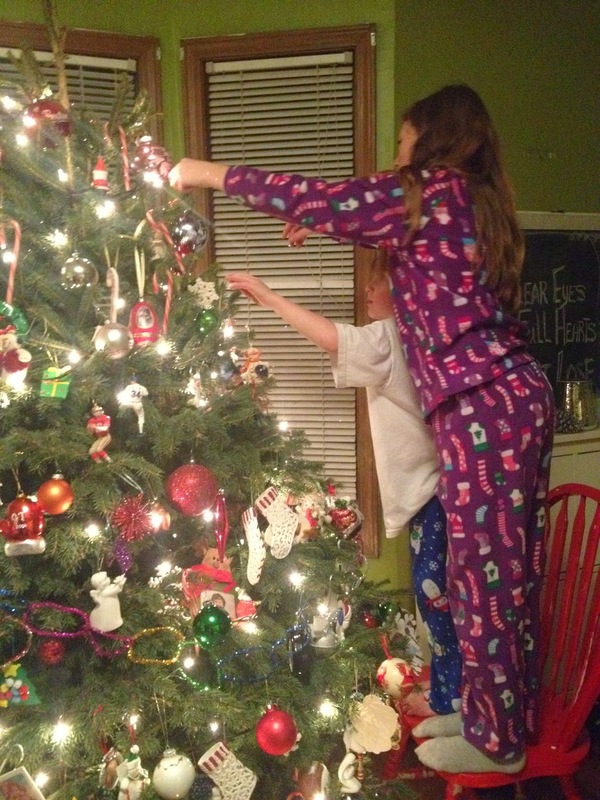 It is for people like me that might battle a few ghosts from Christmas past, but try so hard to be present. Menzel's voice captures the emotion so well. It's like she is singing to me and telling me to get unstuck from the past, and to remember the good, to look around and see all the joy I have in my life right now. In the season when you find some peace in the simple, tender things.. I participated in the Idina Menzel Holiday Wishes album review program as a member of One2One Network. I was provided an album to review, but all opinions are my own. I love Idina. LOVE her. And I love all of these Christmas-y things you're doing already. We've done some, and it's only the 8th, but soon I'll feel like we ran out of time and missed out (that's what happened last year). Sigh.